University of Limerick (UL) today (ceremony at 3.15pm) conferred an honorary doctorate on university alumna and former employee, Vicky Phelan. “Here at University of Limerick, we aim to instil in our students the ability to reason, to solve problems, to participate as citizens, to play their part in the social and political life of this country. The conferring of a UL honorary degree embraces these ideals. It has been awarded to just a small number of women to date, including: the former President of Ireland, Mary Robinson; Adi Roche and Ali Hewson, for their contribution to volunteerism; and, to Catherine Day for her leadership in the European Commission, to name a few. Some recipients, like Vicky Phelan are graduates of UL who have done extraordinary things, who have brought great honour to the university and to its community, and who make us proud," he said. "Vicky Phelan has had a major impact on people’s lives in this most difficult and precious time in her own. Through her courage, commitment and exceptional communication skills, she is highlighting a major issue in the Irish healthcare system. During all of this, Vicky has encouraged the women of Ireland to have faith and to continue participating in the cervical screening programme. 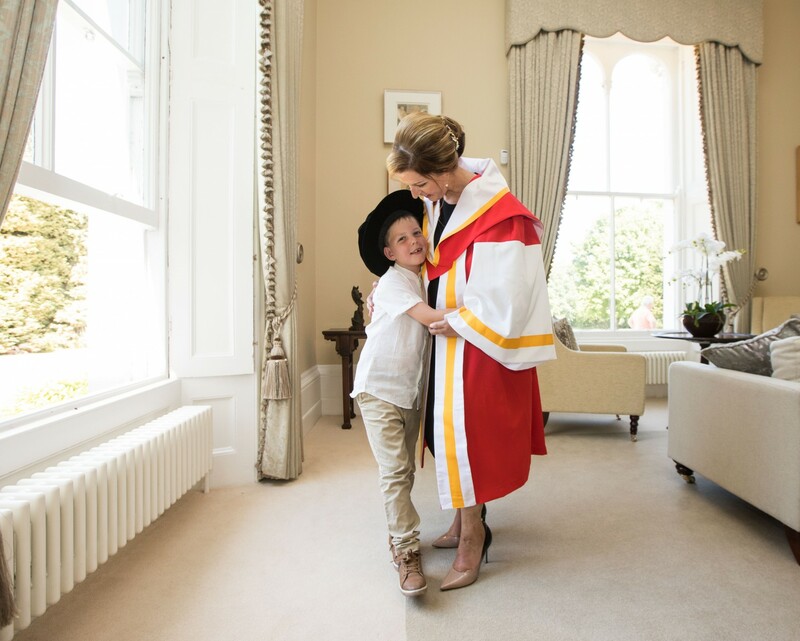 She is an inspiration to our students, our staff and our community, she has brought great honour to the university, and for this we have awarded Vicky Phelan an Honorary Doctor of Letters," Dr Fitzgerald continued. The citation read at the conferring ceremony by Dr Máiréad Moriarty, Assistant Dean International at the UL School of Arts, Humanities and Social Sciences, stated: “The conferring of an honorary Doctor of Letters by the University of Limerick is reserved for those who have distinguished themselves, nationally or internationally, in the arts, sciences, industry, sport, social service or public service. It is for the scale of her positive impact on women’s healthcare nationally and the resulting emphasis on the central position of the patient within that service that we honour Vicky Phelan today. As a UL alumna and a former member of staff, Vicky Phelan exemplifies many of the traits this university endeavours to nurture in its students and staff”. Ms Phelan was joined at the ceremony by her husband Jim, her son Darragh, and her parents John and Gaby Kelly as well as a large group of family, friends and invited guests. Bhronn Ollscoil Luimnigh dochtúireacht oinigh ar a halumna agus a hiarfhostaí, Vicky Phelan, inniu (searmanas 3.15pm). Thug Uachtarán Ollscoil Luimnigh, an Dr Des Fitzgerald, moladh do Vicky as a tiomantas dochloíte don tseirbhís phoiblí, agus dúirt sé gur thug sí inspioráid do mhic léinn, don fhoireann agus do phobal na hollscoile trí chéile. “Anseo in Ollscoil Luimnigh, cuirimid romhainn go mbeadh sé ar chumas ár gcuid mac léinn rudaí a thuiscint, fadhbanna a réiteach, agus a gcion féin a dhéanamh mar shaoránaigh ar mhaithe le saol sóisialta agus polaitiúil na tíre seo. Bíonn na hidéil sin san áireamh nuair a bhronntar céim oinigh de chuid Ollscoil Luimnigh. Níor bronnadh céim oinigh ach ar chúpla bean go dtí seo, agus orthu sin bhí: iarUachtarán na hÉireann, Mary Robinson; Adi Roche agus Ali Hewson, as an obair dheonach a rinne siad; agus Catherine Day as a ceannaireacht sa Choimisiún Eorpach. Is céimithe de chuid Ollscoil Luimnigh cuid acu, dála Vicky Phelan, a bhfuil gníomhartha gaisce déanta acu, a bhfuil dea-chlú tarraingthe acu ar an ollscoil agus ar phobal na hollscoile. Táimid fíorbhródúil astu,” a dúirt sé. “Tá Vicky Phelan tar éis dul i bhfeidhm go mór ar dhaoine ainneoin go bhfuil deacrachtaí móra le sárú aici ina saol féin faoi láthair. Lena crógacht, a tiomantas agus a cuid scileanna cumarsáide eisceachtúla, tá sí ag tarraingt aird na ndaoine ar fhadhb mhór a bhaineann le córas cúraim sláinte na hÉireann. Lena linn seo ar fad, bhí Vicky ag spreagadh mhná na hÉireann le dóchas a bheith acu agus le leanúint ar aghaidh ag glacadh páirte sa chlár tástála ar mhuineál na broinne. Tá Vicky Phelan ina hinspioráid ag ár gcuid mac léinn, ag an bhfoireann agus ag an bpobal, tá an-mheas tarraingthe aici ar an ollscoil, agus mar gheall air sin bhronnamar Dochtúireacht Oinigh le Litríocht uirthi. “Is mór ag pobal Ollscoil Luimnigh an méid atá bainte amach ag Vicky, tugann an dea-shampla atá léirithe aici inspioráid dóibh agus tá bród orthu gur duine díobh féin í. Is mór an onóir don Ollscoil go bhfuil Vicky ag glacadh leis an dochtúireacht oinigh seo – an gradam is airde is féidir linn a bhronnadh,” a dúirt an Dr Moriarty mar fhocal scoir. I láthair in éineacht le Vicky ag an searmanas, bhí a fear céile Jim, a cuid páistí Amelia agus Darragh, a tuismitheoirí John agus Gaby Kelly agus baicle mhór dá gaolta, dá cairde agus d’aíonna eile ar tugadh cuireadh dóibh chuig an ócáid.